Hi guys!! Happiest Friday! What a super quick week! We had the best time with Colby’s fam last week and I have had a really busy, but good week. I went up to LA for a fun night of painting and wine with some of the girls of Rewardstyle. I stayed the night (with Griff!) and had some meetings on Tuesday and also went to take pics at the new painted Liketoknow.it wall in Venice! I will post a pic on Instagram soon, but it’s so fun! Today the Nordstrom sale opens to everyone, so last night I went to South Coast and shopped around. I am 100% an online shopper, but I thought it would be fun to really try some things on so I could pick out some faves that I know are fun. 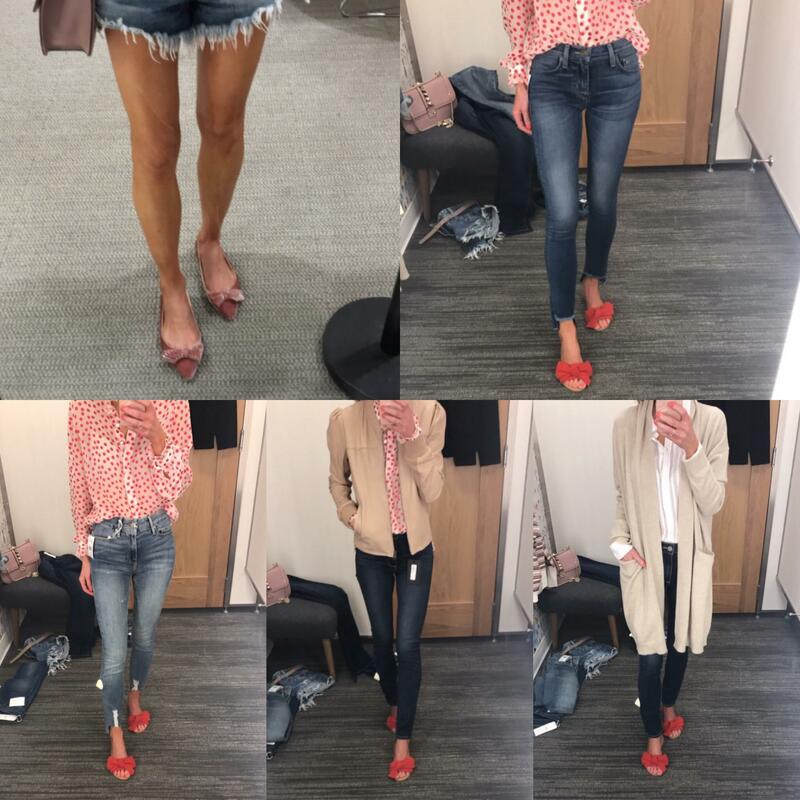 I ended up with three pairs of fave denim, a fun leather bomber, an essential cozy cardi and the most fun blush velvet flats. Below are pictures from my try on and I also did some live videos on my insta stories so be sure to watch if you want to see these pieces in “real life”. I just updated the post below this one with more of my finds that I saw today (including some really cute bedding, Voluspa candles and some fun artwork), so keep scrolling down to see those. My Raye the label sandals are here and my fab Saloni polka dotted top is here.